These local history books are still in print. If you click on the links you will find out where to purchase them. 160 page hardback with over 300 images. The little known history of our area. 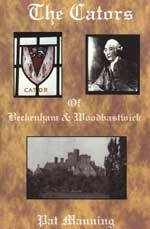 It includes the building of Bethlem and the history of Beckenham Town Football Club. The idea of Cliff Watkins, this book is a compilation of the experiences of over 50 residents of Beckenham, Penge and West Wickham in WW2. This describes Beckenham's years as a Borough in its own right, organised year by year through the Mayors. The book provides the events as the years rolled by. Describes the rise and spread of the family of John Cator from Ross, Hertfordshire, to financial success as Southwark timber merchants and gradual acceptance to the world of the landed gentry. 128 page with over 200 images. Images fromLawrie Park, Clock House, Beckenham High Street, Croydon Road, Kelsey Park, Eden Park, Elmers End, Shortlands and West Wickham. 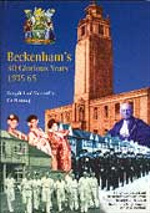 This is a reprint of the 1987 edition and it includes the 1967 publication of Manors Of Beckenham. The book contains 320 pages in A4 size and is the most comprehensive listing of the post cards of The Crystal Palace ever undertaken. Profusely illustrated it covers the building and the many events and exhibitions that took place there until it was desroyed by fire on the 30th November 1936. 141 page with over 175 images. First published in 2004. The books script and images provide an insight to the local scene and provides a fuller picture of what is a vast canvas. The book contains 160 pages in A4 size and has 94 Black and White images. A Social history of the Triangle mid 20c including shops, firms and personnel memories of the nostalgia that once was the Triangle. Whoa! such an informative post, all the details of the books that you have shared with us is amazing and really useful. I am thankful to the author for such an essential sharing! Great work! Interested in "In Pursuit of the Perfects" as I am related to Iris Beazley.. could you please put me in touch with Pat Manning or Andre Perfect?